The perfect trip for your family and friends. 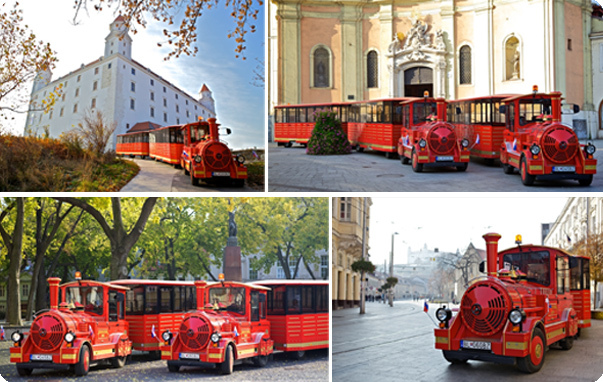 Take them to Bratislava's forests, Devin Castle or sightseeing to Bratislava Castle. Or you can rent the train only for yourself. During the trip you will get interesting information about the city from our great guides. Thanks to 56 seats per train we can take also 2 classrooms on a school trip. Taking four trains (224 seats), we can take whole kindergarten or even school at once. Trains could park directly in front of school... contact us. For the youngest is the drive by red train a memorable experience. Bratislava City Train appreciate also seniors with limited mobility. Join us - drives at any weather, because in addition to comfortable seating the train has also fixed roof. The train can be decorated according your needs.